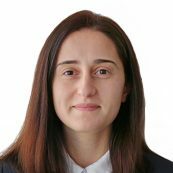 Tamta Revazishvili is a Logistics Assistant at PYXERA Global on the Global Pro Bono team, where she supports program management throughout the division. Prior to joining PYXERA Global, Tamta worked at Oxfam Georgia for EU-funded Food Security and Nutrition Project as a project assistant. Tamta received a BA in Business Administration from Ostfold University, Norway and a M.A. in Agri-business and Rural Development, Hungary, where she was a recipient of FAO scholarship. She is passionate about food systems management and sustainable farming.